It's no secret that health supplements can benefit everyone from sedentary adults to elite athletes. The supplement industry is continually growing and higher quality supplements are popping up all of the time with more and more uses. I personally use an array of supplements both in training camp and out. Although a lot of people may believe some supplements are more of a placebo than anything, I think it's important that everyone know what they are taking and why, as well as listen to your body and see which ones work for you. I am by no means an expert on the subject and am continually learning as I improve myself and continue in my sport, but I have found gains in using these. Opti-Men - Opti-Men is a high potency multi-vitamin by Optimum Nutrition. This multi has a huge profile of high quality vitamins, minerals as well as extras such as digestive enzymes, aminos and more. The only issue is it is said that Opti-Men are not safe for those under 18 as there is an ingredient called "Orange Triad," a digestive enzyme which is not safe for the young. CLA - Conjugated linoleic acids, or CLA is a group of linoleic fatty acids primarily found in beef, lamb and milk in small amounts that when ingested are believed to increase the body's ability to metabolize fat within the body. The science behind this is that our body requires a certain amount of CLA to run at an efficient rate and our modern diets don't provide a high amount of CLA naturally. Many studies suggest that CLA does not necessarily help get rid of fat that is already present in the body as much as it decreases the fat accumulated while taking the supplements. There is a lot of speculation around this supplement and it is not to be considered a "magic diet pill," rather it is an aid and another tool in the journey to a leaner body mass. Cal-Mag - Cal-Mag is a combination of calcium, magnesium and vitamin D and often contains other minerals such as zinc, copper, manganese and more. There are many benefits to this supplements including improved bone density, nerve transmission, muscle contraction and more. I personally take it because when in training camp I'm often training 4-5 hours per day, with the first 1-2 hour session in the morning, and another 2-3 hour session in the evening. Because of this my body is under a lot of stress and requires more vitamins and minerals than the average adult. I find when training heavily I'll get severe cramps and spasms. It's been found in studies that muscle cramps are often due to dehydration, low potassium and/or a deficiency in calcium and magnesium. Once I added Cal-Mag to my diet I found the spasms and cramps nearly gone. I don't take the full suggested serving as my diet and other supplements do offer some of the required amount already, but analyze your intake and see how much you need to remain balanced. Glucosamine and Chondroitin - Glucosamine and chondroitin are two molecules found within our joints. They are used to lubricate and repair the joints while decreasing inflammation from everyday stress. As an athlete, especially in MMA, our joints are taking a beating everyday and extra assistance is needed. Glucosamine as a supplement is derived from shellfish and those with an allergy should consult a physician before taking. Aminocore - Aminocore is an intra-workout formula (meaning to be ingested while training) by Allmax Nutrition which consists of branch chain amino acids (BCAA), B vitamins and zero calories. During a workout our muscles take a beating and begin to breakdown. To avoid this breakdown and increase repair, recovery and the building of new muscle, amino acids are needed. Amino acids typically come from the breakdown of protein but are able to be taken in the form of BCAA's. By ingesting an intra-workout formula while training you increase the muscle synthesis and speed up the recovery and building process while minimizing catabolism. Typical formulas also contain little to no calories which allow you to continue to build muscle while burning calories. Isoflex Whey Protein - Isoflex Whey Protein is a brand of whey isolate protein powder by Allmax Nutrition. Whey isolate is a lean form of protein which will assist in the repair, recovery and building of muscle. Whey protein powder is also the best form of protein to be taken post-workout as it is quickly digested and transported to the muscles, again speeding up the recovery process. Whey often comes in many brands, flavours and portions, however be sure that you pick a high quality isolate such as Isoflex, as many forms of protein are cheap or less pure and will cause problems such as constipation, gastric complications and more. ZMA - ZMA, or Zinc Monomethionine Aspartate is a combination of Zinc, Magnesium and Vitamin B6. ZMA as a supplement is designed to be taken at night time to increase in quality sleep and hormone regulation. Athletes often experience disrupted or low quality sleep while in heavy training and this is sometimes due to low zinc and magnesium levels. ZMA is also believed to increase testosterone and growth hormone levels naturally, however these finds have received a lot of speculation. ZMA should be taken on an empty stomach and not around the same time as calcium, which blocks the absorption of zinc. Melatonin - Melatonin is a hormone excreted from the pineal gland which aids in sleep duration and quality and is also available in a supplement form. It is not physically addictive however it is recommended that it not be taken longer than two weeks at a time as there are risks of psychological dependence. 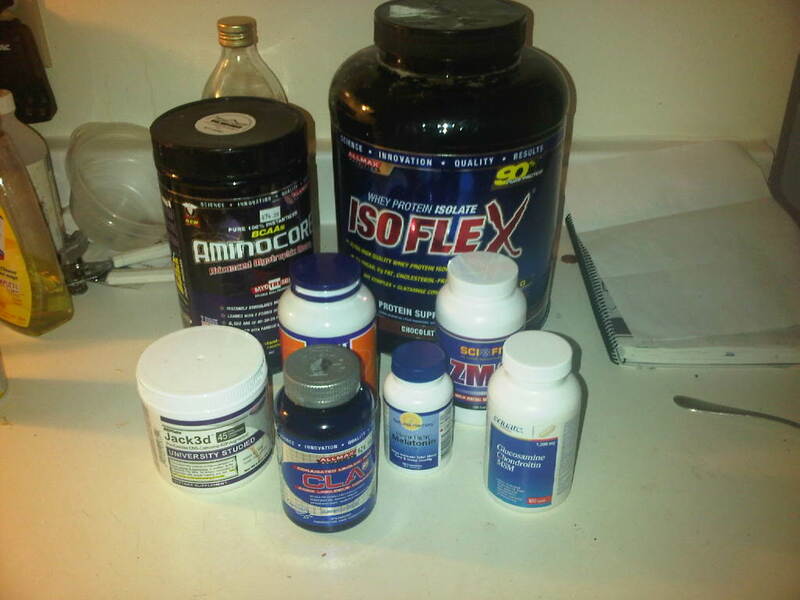 These are the supplements I'm taking while in training camp. I often switch up, add or take away supplements depending on what my goals and interests are. I have also taken Anabolic Prescription by Rivalus, which is a great testosterone booster, natural GH releaser and ZMA combination, as well as creatine monohydrate, and sometimes dextrose in my post-workout shakes.